The need and appreciation of our work is illustrated in the quotes below taken from the many letters of gratitude that KatCanDo has received. “.... I just wanted to say thank you for the team’s time investment with us today. 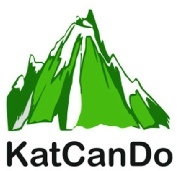 I was both inspired and humbled by what KatCanDo has achieved and for the great style in which you have realised this success. Lynda Petley,Point-of-Care Manager, Frimley Park Hospital. “..this is an essential piece of equipment for running our Rapid Access Clinics for the assessment of women suspected of having gynaecological cancer. We have dedicated clinics whereby women who have been referred urgently can be seen in an outpatient setting and undergo initial investigations on the first visit. This means a faster diagnosis and progress to further treatments”.